Homeowners looking for a way to automatically water their lawn often install a lawn sprinkler system. 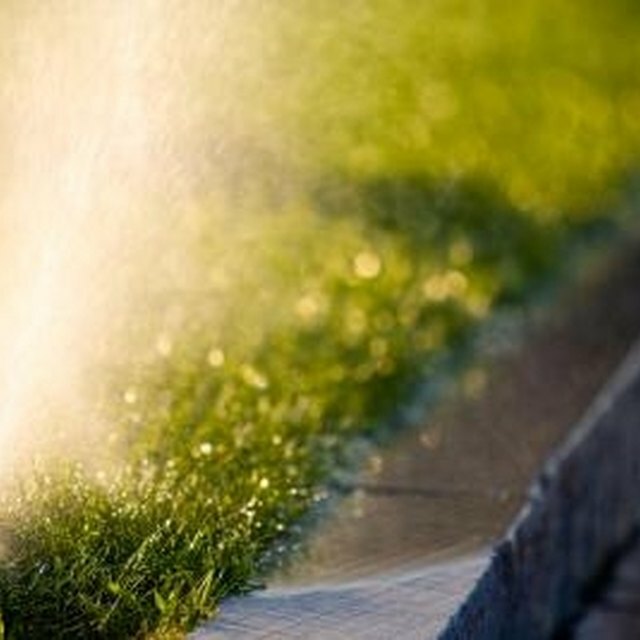 Lawn sprinklers effectively deliver the proper amount of water at set times to help maintain grass, gardens and trees. Occasionally, lawn sprinkler risers and heads will become damaged or clogged due to lawn cutting, ground unsettling, severe weather or old age. Replacing these components and flushing debris from the sprinkler system can effectively repair a lawn sprinkler and get it back into working shape. Lawn sprinkler heads and risers occasionally require repair. Dig up the lawn and soil surrounding the damaged sprinkler head, using a small shovel; then use your hands to remove the remaining soil nearest the pipes. Avoid damaging any buried pipes while digging with the shovel. Unscrew and remove the sprinkler head with your hands; then use a hand trowel to remove the riser. Purchase a new sprinkler head and riser that is exactly the same as the old ones to be sure that they will fit perfectly. Wrap the ends of the riser with a thin layer of Teflon plumber's tape. Use a small cup to remove any excess water from the hole; then use a toothbrush to clean the spout of the pipe in the ground that attaches to the riser. Screw the riser onto the pipe in the ground, using your hand. Make sure not to strip the threads on the riser. Purge the sprinkler system by turning on the water once the riser is installed. Replace the sprinkler head and refill the holes in the ground with soil and grass once the system has been thoroughly purged. Test the lawn sprinkler to be sure that it's working properly.